Typography is a discipline of Graphic Design. This might be my closest inlet to that claim aside from designing business (type) cards [more at pitch or selling myself/contact me cards] for work searching. This is the top page of the first page of my notes for something I might call Alphabet Declination-a switch-out of the English alphabet for icons of ideas, topics, notions or or and objects or portions there-of-written in a progression to show changes in the writing of it favoring the trappings of great use as over generations.-Ernie Moore Jr. Writing for an important note can vary from writing to record word for word what someone is saying. In which case the writing is less big-trying to more fastly finish the letters to more quickly get to the next letters. Ends of lines drag on beginnings of lines. Curves straighten. What was longer becomes shorter. And except for typeset or fixed lettering there’s a morph. Here pictures/icons become symbols–letters, yet related to the original subject/basis/framework of the alphabet. [Note:I like how writing shortcutting seems to match speaking shortcuts an how a language in use changes or declines because of use. In the languages progression it declines; I suppose since it starts out at how it should be there is only maintaining that or distortion.-Ernie Moore Jr. This alphabet declination I’ll refer to as AB Blue Bird. 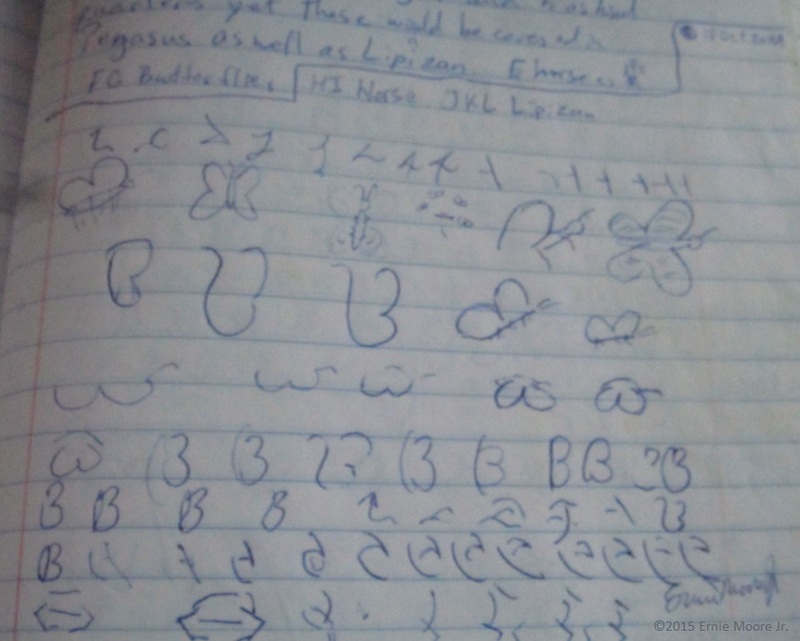 Blue Bird is close to my using the topic initials of Butterflies, Lipizzon, Unicorn, Horses, Pegasus, a signature pose of the Atari arcade game Gauntlet Legends’ character Blue Valkryie, Rainbows, Dolphins–BfLUPBv.-Ernie Moore Jr. Still a work in progress from October 2012 it seems. I’d like to finish this, which I might be able to work-out here as I present what I have so far so my thinking can be seen [Note: I like to look at thinkings]. I finised something for all the English letters. And there is a model for my alphabet declinations, however, If you look into me you’ll see I use photography of accidental or discovered art and camera motion to get images within images. 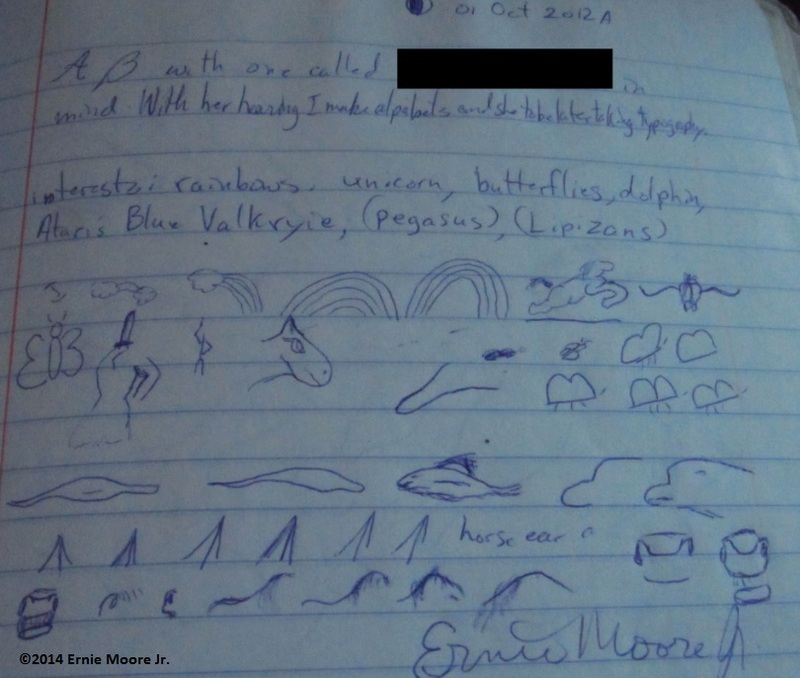 From these I had hoped to find shapes reminiscent of representative figures/images/drawings/works I might study to improve my repertoire of drawing styles/tactics/techniques.-Ernie Moore Jr.
You see my lack of understanding of wings on a horse inhibits progress for developing a letter based on pegasus. And a lack of ability to translate what I have of horses to paper inhibits letters based from horse or unicorn (though horse for unicorn is only head, neck and body-as the tail is lion and the legs are deer-again, my drawing and my database for these things.-Ernie Moore Jr.
I’ve done AB Declinations based from automobiles, rain, reading, and a gardening graphics design teacher.-Ernie Moore Jr.